What do you think of Alex Schuman’s new venture during the first season of the Alex, Inc. TV show on ABC? As we all know, the Nielsen ratings typically play a big role in determining whether a TV show like Alex, Inc. is cancelled or renewed for season two. Unfortunately, most of us do not live in Nielsen households. 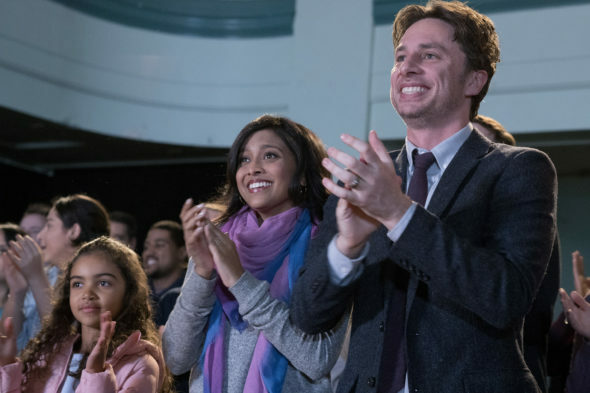 Because many viewers feel frustration when their viewing habits and opinions aren’t considered, we’d like to offer you the chance to rate all of the Alex, Inc. season one episodes here. An ABC sitcom, Alex, Inc. stars Zach Braff, Tiya Sircar, Hillary Anne Matthews, Michael Imperioli, Audyssie James, and Elisha Henig. The family sitcom centers on successful radio journalist Alex Schuman (Braff). One day this husband and father quits his job in order to found his own podcast company. His wife, Rooni (Sircar) — a lawyer — is skeptical, initially. Still she, their kids, Ben (Henig) and Soraya (James), Alex’s cousin Eddie (Imperioli), and former producer Deirdre (Matthews), rally around him and put their everything into his launch. What do you think? Which season one episodes of the Alex, Inc. TV series do you rate as wonderful, terrible, or somewhere between? Should ABC cancel or renew Alex, Inc. for a second season? Don’t forget to vote, and share your thoughts, below. More about: Alex Inc., Alex Inc.: canceled or renewed? Goodbye — did not like the show. I’m sad I hope they change their minds about cancelling it. It’s different and fun, the cast also had a well balanced vibe to them. They should be given one more chance. I love this show. DO NOT KILL IT. It may be off to a slow start, but the premise and cast are excellent. Keep it.